This cocktail was created as gift to mark the 30 year, Pearl Wedding Anniversary of a couple who work hard all year on the farm and in the local community and enjoy an annual cruise to far flung lands as a reward. 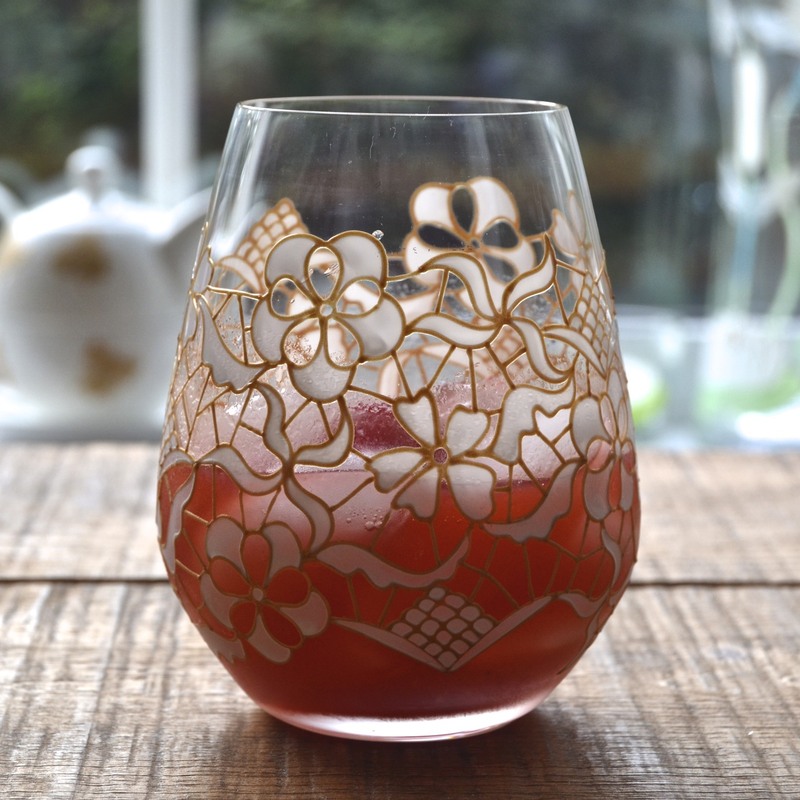 From the brief I was given, I wanted to create something that would combine quintessentially British flavours with something a little more cosmopolitan, that was both fruity and sweet. The name of the cocktail refers to the couple's initials, but serendipitously also stands for 'tender loving care', without which, a marriage is unlikely to last 30 years. 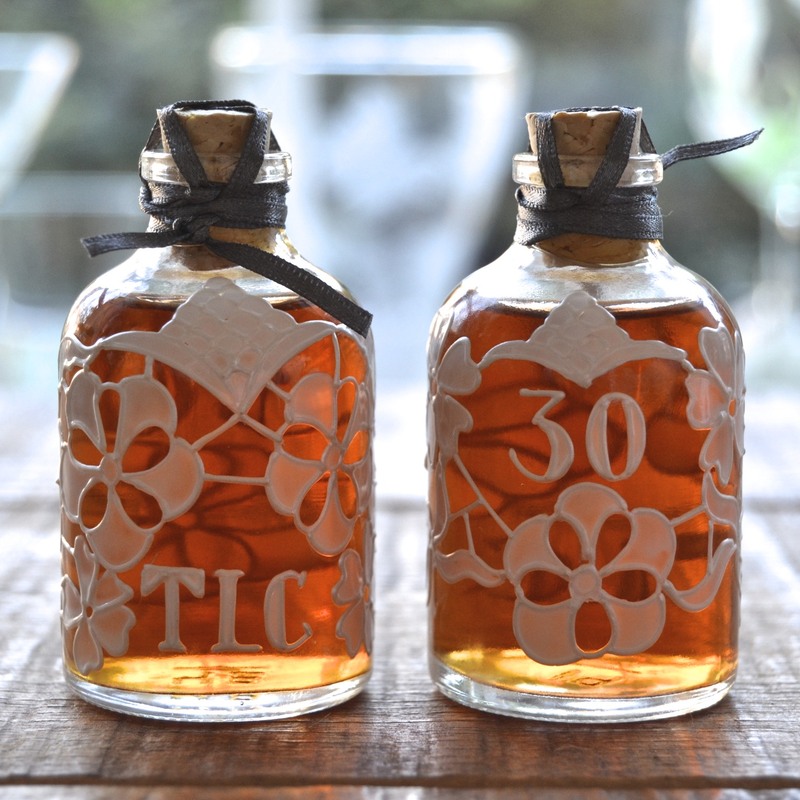 The bottles were hand painted in a lace design with a pearl outline and the number 30 entwined into the pattern to represent their 30 years of marriage to one another. The recipe calls for fresh raspberry purée which is easily made by squishing the raspberries through a sieve with the back of a spoon - collect the purée in a dish and discard the pips. About 4 large raspberries should be enough to make a tablespoon of purée. The dash of lemon juice should be fresh, not the bottled type, but is literally, just a tiny squeeze, less than half a teaspoon. Although seemingly minuscule, that little dash just adds a freshness and depth to the alcohol. Should you wish to make their signature cocktail for yourself, you will need to invest in a bottle of Martin Miller Gin (highly recommended with Fever Tree Tonic for an exceptional G&T), Cartron Crème de Pêche de Vigne and Giffards Crème de Framboises (both delicious when added to fizz in the style of a Kir Royale) and a sweet vermouth such as Martini Rosso which is an essential ingredient for many cocktails, including my current fave, the Negroni. Add all of the ingredients to a cocktail shaker with a handful of ice (cubed, not crushed) and shake hard until the outside of the shaker becomes frosted (about 20 secs). 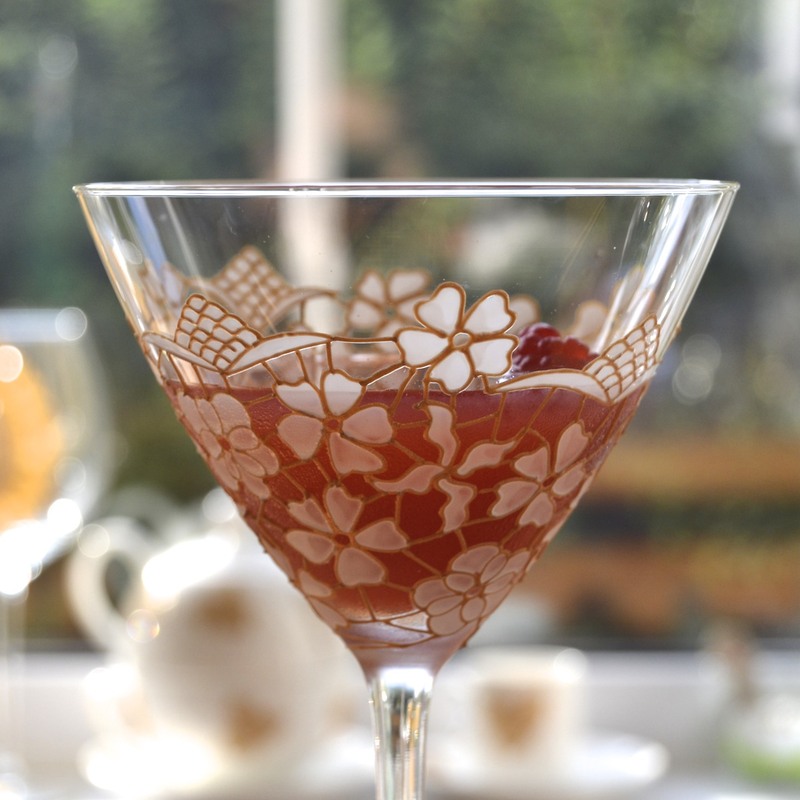 Strain the contents into a chilled martini glass and garnish with a raspberry or two on a cocktail stick. If you find the drink a little intense, served this way, why not try it served over ice or topped up with champagne - delicious!